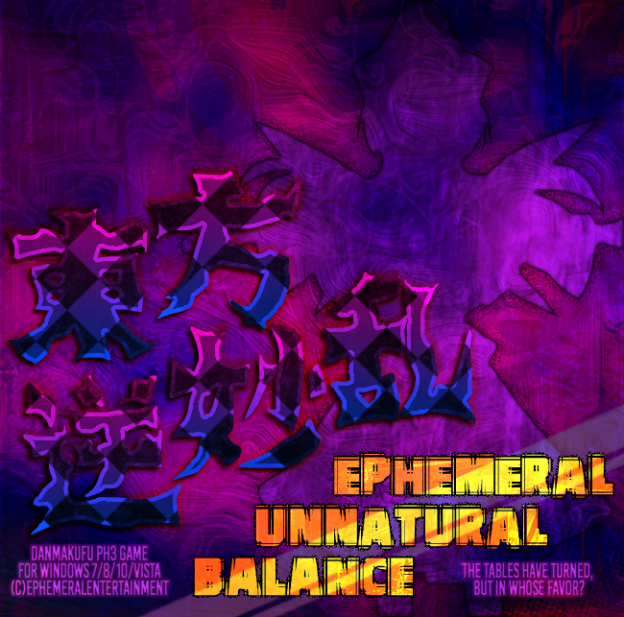 Ephemeral Unnatural Balance is a Touhou Project fan game. It’s a top-down shooter very similar in style to Touhou, with 6 stages and an Extra stage. Players fight through stages of enemies, defeat a midboss, and then defeat a spellcard-wielding boss at the end of each stage. There are 4 difficulty levels for the main 6 stages and 2 difficulties for the Extra stage. A 3-stage trial version of the game was released in 2015. The game is currently aiming for a Janurary 2019 release on Steam!! Springtime, for Reimu and Marisa. Or, it would be, had the two of them not grown unable to move. They are not alone. All over Gensokyo, the skilled and powerful grow weak and clumsy. The small and insignificant seem to have inherited this power, and are quickly moving to take over as the new leaders of the land. A course of action most…unnatural. Rin Satsuki, once a figment of a history that never was, is now tasked with handling the incident in place of the Hakurei shrine maiden. Kasen Ibaraki, somehow spared by her isolation, now seeks to restore balance to Gensokyo before it tears itself apart. The third player character will be revealed in the final game! To remap keys, use the included config.exe. The Discord and Skip Dialogue keys are marked as USER1 and USER2, respectively. Config.exe also has limited gamepad support, but it may not be reliable. It may be better to use 3rd-party gamepad to keyboard mapping software. The Balance Gauge is filled by collecting Balance Items. Bombing lowers the gauge by 30% of its current value capping at 20% of the max gauge. Dying raises the gauge by 10%. Point Items are worth anywhere from 100% to 200% of the Point Item Value (PIV) depending on how full the gauge is when they are collected. When the gauge is filled, all Balance Items become Bonus Items which are worth the same as Point Items at max Balance. Spellcards are named attack patterns used by boss characters. A Spellcard that has been defeated without using a bomb or dying within the time limit is considered “captured”. Captured Spellcards award the player a Spellcard Bonus depending on how long it took to defeat. Some Spellcards are still considered captured even if the time limit is exceeded. These bonuses are static and non-decaying. Any boss attack pattern that is not a Spellcard is referred to as a “Nonspell”. Encore Spells are special Spellcards used by most stage bosses if they are defeated while the Balance Gauge is 80% or higher. The player cannot bomb during Encore Spells and will not lose a life if hit. They drop 2 Life pieces if captured and 1 if failed. Discord Encore Spells can be fought instead if the player reaches the end of a boss with Discord active. In addition to being more difficult they drop 4 Life pieces if captured and none if failed. Pressing the Discord button (Default: C) activates Discord Mode if the player has at least 40% of the Balance gauge filled. Discord Mode has an activation cost of 10% of the Balance Gauge and consumes 2% gauge per second. Once activated, it may be cancelled by pressing the Discord button again, but only after being active for at least 3 seconds. Player shot types gain new attributes and shot power increases by about 20%-25%. All enemy attacks become more dangerous. All Balance Items become PIV Items, which increase the PIV by 30 each. During Spellcards, a Discord bonus is slowly accrued at 3 times the Spellcard bonus decay rate as long as the player remains in Discord. The Discord Bonus is awarded if the Spellcard is captured. When a Spellcard or Nonspell is captured, the player will be refunded a portion of their Balance gauge depending on how long they remained in Discord. If the player is struck, they will lose 12% of the remaining Balance Gauge and automatically bomb, costing 2 bombs instead of 1. If the player has no bombs, they will die. Entering and exiting Discord Mode during a Spellcard will NOT forfeit the spellcard bonus. Extra lives are gained by obtaining 8 Life Pieces. One is dropped by every captured Spellcard and certain stage enemies. The number of pieces required increases by 2 for each life gained in this way. Extra bombs are gained by obtaining 4 bomb pieces. One is dropped by every “captured” Nonspell and certain stage enemies. For every 11 seconds of time the player spends in Discord mode, the player will be earn 1 Life Piece. All earned pieces are awarded when Discord ends. Progress towards the next life piece will be saved between Discord uses, but will be lost upon death. There is a meter tracking this in the bottom left corner of the screen. Power – Adds 0.01 power to the player and is worth 100 points. The player’s shot powers up at increments of 1.00 power. If the player’s power is 4.00, it is instead worth 10,000 points. Big Power – Adds 0.05 power to the player. Power items are converted into these items if the player’s power becomes too low for certain parts of the game. Full Power – Automatically grants the player full (4.00) power. Point – Adds the current Point Item Value (PIV) to the player’s score. This amount is increased by up to 100% depending on how filled the Balance Gauge is. Balance – Adds 1% to the Balance Gauge. If the gauge is already 100%, then it becomes a Bonus Item. Balance Bonus – These function the same as Balance Items but are produced and auto-collected as part of the Balance refund for boss patterns completed in Discord. PIV Item – Adds 30 to the Point Item Value (PIV). These are only dropped during Discord. Delete Item – Adds 1+(Graze Counter/200) to the PIV. Cancelled bullets are converted into these and auto-collected by the player. Items can be collected by moving near them OR going above the Point of Collection (PoC). The PoC’s location is marked on the left of the screen. The more filled the Balance Gauge is, the lower on the screen it will be. A bullet is “grazed” when the player moves close enough to it without getting hit. Delete Items will increase the PIV more depending on the Graze counter. Main Game – Play through the main 6 stages in order one after another. There are 4 difficulty modes: Easy, Normal, Hard, and Lunatic. Continues are allowed after the player has died with no extra lives remaining. No matter the difficulty, the player will always have 9 continues available. Whether the player gets the Good or Bad ending depends on whether they used any continues. Extra Stage – Play through the extra stage. There are 2 difficulty modes: Extra and Dissonant Extra. The player cannot change the number of starting lives in the options and continues are not allowed. Boss Mode – Play through the main series bosses in order. No bombs or continues are allowed and the player cannot change the number of starting lives in the options. Discordant Mode – This mode forces the player to remain in Discord mode permanently. Instead of using the Balance gauge to activate Discord, its new purpose is to allow the player to Flash Bomb. Flash Bombs clear bullets and mark large enemies. Marked enemies drop additional items upon death, either PIV Items or Life Pieces. Stage Practice – Play through a single stage in the main series. The player will be allowed the maximum number of lives. No continues are allowed. Spell Practice – Play through a single Spellcard in the game. Bombs and regular Discord use are not allowed and dying immediately ends the Spellcard.